The Educator – December 3, 2018: For students preparing to leave school and enter the workforce, launching into vocational training can often be first and foremost on their minds. However, in some countries, the status of vocational training is not as prominent as it should be. According to some, this can complicate efforts to provide students with the hands-on vocational skills they want – and need. The Skilling Australia Foundation (SAF), a not-for-profit organisation which conducts skills assessments and provides relevant Industry based short courses, has called for the status of the vocational training industry to be raised. SAF CEO, Nicholas Wyman, said an effective training market is only possible when the consumers in that market – being students and employers – are “fully empowered to make appropriate choices”. 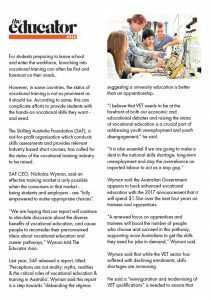 “We are hoping that our report will continue to stimulate discussion about the diverse benefits of vocational education, and cause people to reconsider their preconceived ideas about vocational education and career pathways,” Wyman told The Educator Asia. Last year, SAF released a report, titled: ‘Perceptions are not reality: myths, realities & the critical roles of vocational education & training in Australia’. Wyman said this report is a step towards “disbanding the stigmas suggesting a university education is better than an apprenticeship. “I believe that VET needs to be at the forefront of both our economic and educational debates and raising the status of vocational education is a crucial part of addressing youth unemployment and youth disengagement,” he said. Wyman said the Australian Government appears to back enhanced vocational education with the 2017 announcement that it will spend $1.5bn over the next four years on trainees and apprentices. “A renewed focus on apprentices and trainees will boost the number of people who choose and succeed in this pathway, supporting more Australians to get the skills they need for jobs in demand,” Wyman said. Wyman said that while the VET sector has suffered with declining enrolments, skills shortages are increasing. He said a “reinvigoration and modernising of VET qualifications” is needed to ensure that traineeships, apprenticeships and general certificate and diploma-level training are seen as attractive pathways for people undertaking the school to career transition. “In Australia we are seeing evidence of a ‘lost generation’ – a large number of young people who are neither in school nor in the work force,” Wyman said. Wyman said it is important for people to research training providers. “They should not only look at price – but also quality,” he said. Wyman said other challenges remain around quality across the sector. “The government and regulators have placed a great deal of effort into this of late, weeding out the under performers,” he said.